Biographical note: Wilfred Cude, M.A. Wilfred Cude is the author of A Due Sense of Differences (1981), The Ph.D. 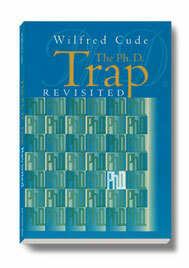 Trap (1987), and The Ph.D. Trap Revisited (2001), and numerous scholarly articles on English literature, Canadian history, critical methodology and educational traditions. He has lectured at seven different colleges and universities across the country. He is currently completing a novel about William Henry Jackson, the dropout from the University of Toronto who served as secretary to Louis Riel during the rebellion of 1885. His next literary venture will be an account of the 1933-34 NHL Season, in which his goaltending father Wilf Cude Sr. helped bring the Detroit Red Wings to the Stanley Cup final. Wilf Jr. lives with his wife, the novelist Mary Pat Cude, in a small house they built for themselves in rural Cape Breton on the shore of the Loch Bras D'Or.